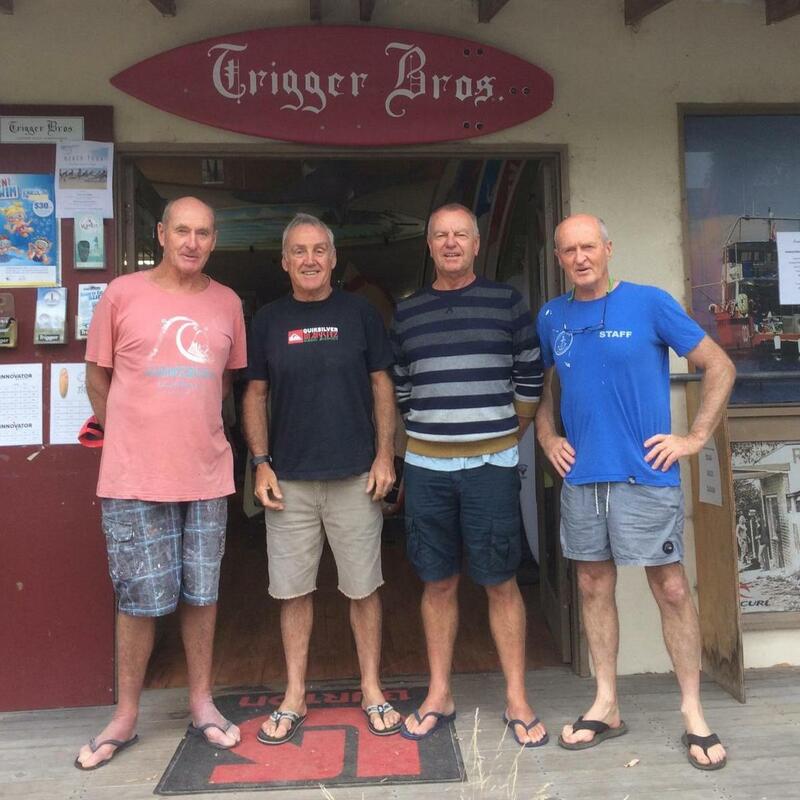 This summer Trigger Bros Surfboards have been on the water for just over 50 years which is not a bad feat when you consider how many well known manufacturers are no longer with us. Whilst wishing a Happy New Year we would like to acknowledge our Staff who have travelled this journey with us. September 1968. Boards Number 2 and 3. Phil 17 with first ankle injury. Paul 18. John Jolly: 40 years as our glasser. 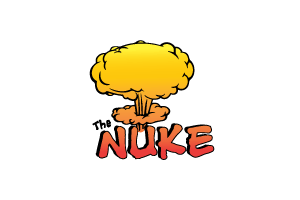 Started with us in July 1978. A highly skilled perfectionist who loves the challenge of a big wave. John’s annual pilgrimage to Angourie, some 50 trips since the early seventies, proves you don’t have to travel offshore to find Nirvana. Alan Francis: 33 years surfboard repairer extraordinaire and occasional glasser. Mr Fixit at our factories. Should have been an electrician. Paddles a SUP in the Bay for fitness and can run for miles. He also plays a mean guitar! Vee: 10 years an amazing woman who is just as competent in the glassing room as she is with customers in store. Loves to surf. We are hoping her kids grow up quick so she can return full time. Simon Forward: 20 years. Powerhouse surfer shaper who has picked up on the technical advances in surfboard production and put them to good use. One of the best bloke’s ever to share a wave with. 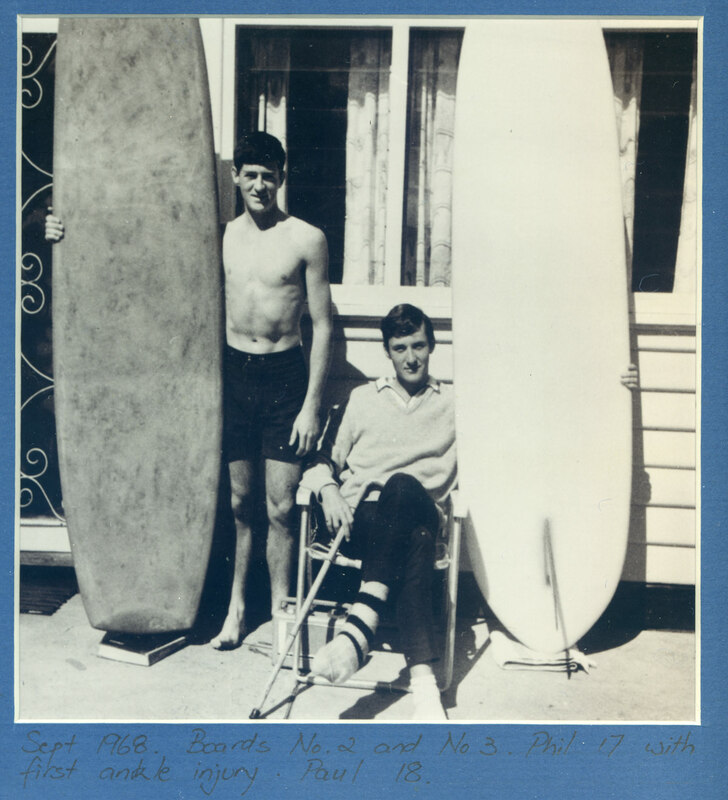 The Brothers Phil and Paul still enjoying surfing, sharing that experience with others and creating a magic board for someone special. Jon Poole: The Charismatic Canadian 18 years on board and has almost lost his accent. Store manager who knows every aspect of the business and his friendly demeanor has created a huge following. Hannah Trigger: 4 years Full Time (this is debatable as she always seems to be on holidays)- 10 years Part Time while training to become an Olympic snow queen. Has morphed herself into a surfer with regular trips to Hawaii. Ellen Trigger: 11 years. Warehouse stock manager jackeroo of all trades and prefers to deliver goods by Horse. Matt Trigger 30 years Director Buyer and Online. A thought provoking ideas man who can fix anything and loves to play tricks on fellow staff. Along with Stu still a very passionate sailboarder. Can ride any craft especially if it’s out there and challenging. Believes the earth is flat and any other conspiracy theory on the internet. UFO investigator. LtoR:Matt Trigger, Phil Newman, Stu Matthews, Phil, Cocky, Liam, John Jolly, Paul, Shane Carter, Peter Baker. Phil Newman was the frontman for the Chelsea auction, weekend warrior at Leo, beach sales and research, self proclaimed Stubby Ambassador, avid board collector, survivor, been riding our boards since the 70’s. Peter Wilkinson: 32 years – The key front man for Trigger Bros coming on board in the mid 70’s with enormous energy to get things done especially the development of multiple stores. Always fun to work with. Gordon Smith “ Flash Gordon “ 10 years. Supa keen surfer who came to us with zero skills and left for Ullahdullah an expert repair man, sander and polisher. Simon Trigger: 19 years. A passionate surfer who took on retail at our Sorrento store and really made a great connection for us with the locals. Qualified as a builder Simon was the perfect conduit when we moved from Mornington Central to the Main street overnite. Chloe McColl: Around 12 years at the Sorrento Store. An assistant manager and ladies buyer. Chloe played a huge part in the success of our popular by the sea Store. Arthur Brett: 7 years. – Came on board as a Sailboard Team Rider, learned to shape, managed the Frankston Store and left to setup a Trigger Bros franchise in Brighton. His determination and professionalism has seen him win World titles and is currently coaching at Olympic level. Jo Trigger: 12 years as shop manager, Jo had high energy passion to put T Bros on the map. She took on lots of after hours promotions into building the ladies side of the business while also overseeing the manufacturing of the men’s, ladies and kids garments. The store was vibrant and she had an excellent rapport with the customers. Liam McCafferty: 10 years. One of our favourite employees who was always ready to take on any new adventure. 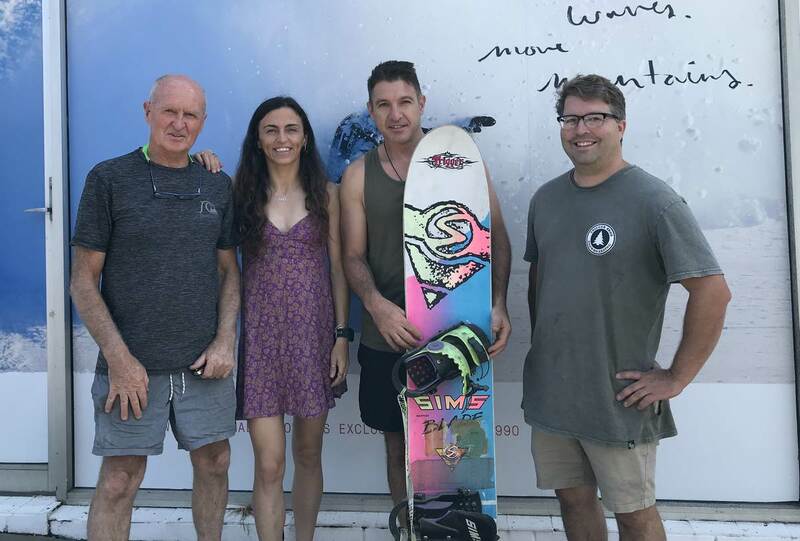 He was instrumental in our employment of the Wiz kid Shane Carter and subsequently the key figure to kick off Trigger Bros Snowboarding when he ordered in a Sims Switchblade for our number one Frankston skater Enzo Verga. Enzo with the Sims Switchblade, Paul, Hannah and Jon Poole. Shane Carter: 12 years. Came to us as a wild looking Street Skate kid down from Albury who along with Liam introduced Trigger Bros to Snowboarding. He radiates positive energy for the sports he loves, works like a maniac and there is no Mountain he can’t climb. Aaron Winsbury: 10 years. When not travelling through Europe, he was our Skateboard King, just don’t ask him to surf (he may be afraid of the water). He’s also pretty handy on a snowboard. Peter Schuster: 12 years. 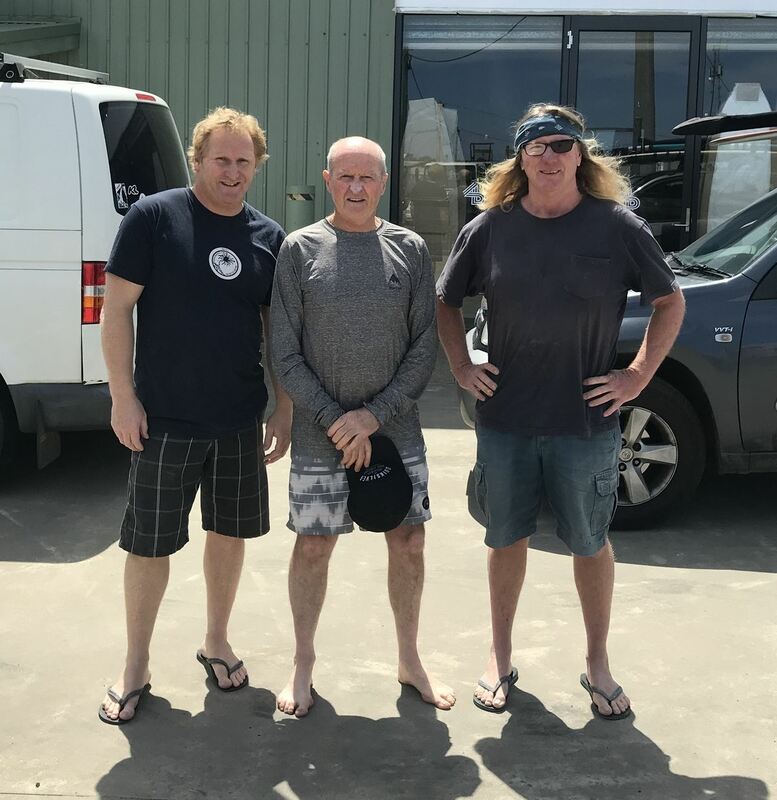 Before coming to us Pete was a key figure in the overseas production of Wavelength Wetsuits so as well as managing the Mornington outlet he was an invaluable asset in our offshore requirements. Garry Taylor: 15 years. Two years on the World Pro Circuit is testament to his ability on a Surfboard but he could also Skate and Snowboard at a very good standard. As a shaper he had a huge following on the Peninsula but some 10 years back he downed the tools and now resides at the base of Mt Hotham. Kenny Reimers: 7 years. A brilliant free surfer who we taught to shape but unfortunately for us moved to Qld with his family. On the Gold Coast Kenny applied his genius to profilers and later Cad Machines. Most of the big time manufacturers up North and indeed Trigger Bros owe their step into modern surfboard technology to K.R. An innovative thinker there is not much that Kenny doesn’t know about when it comes to surfboard design. Ian Cochrane: 10 years. Joined us as 15 year old. Our first employee and on his way to becoming our most naturally gifted surfer/shaper. Through his parents initiative we started the Trigger Bros clothing label. 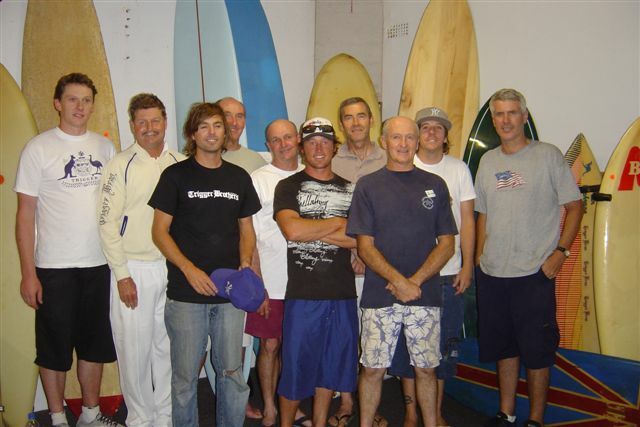 Ian Struggled to maintain his passion for surfing and reverted back to footy, cricket and golf. L to R: Paul Trigger, Ian Cochrane, Phil Trigger. Phil Grace and Ted Bainbridge Gracie was the first professional manufacturer to come to our backyard in 1969 and teach us a few tricks on glassing. He also helped out in the shaping of over 100 boards when we were short on staff. As cunning as a fox and handy with a paint brush he showed us the way to rejig an old bomb by switching the rego plates. 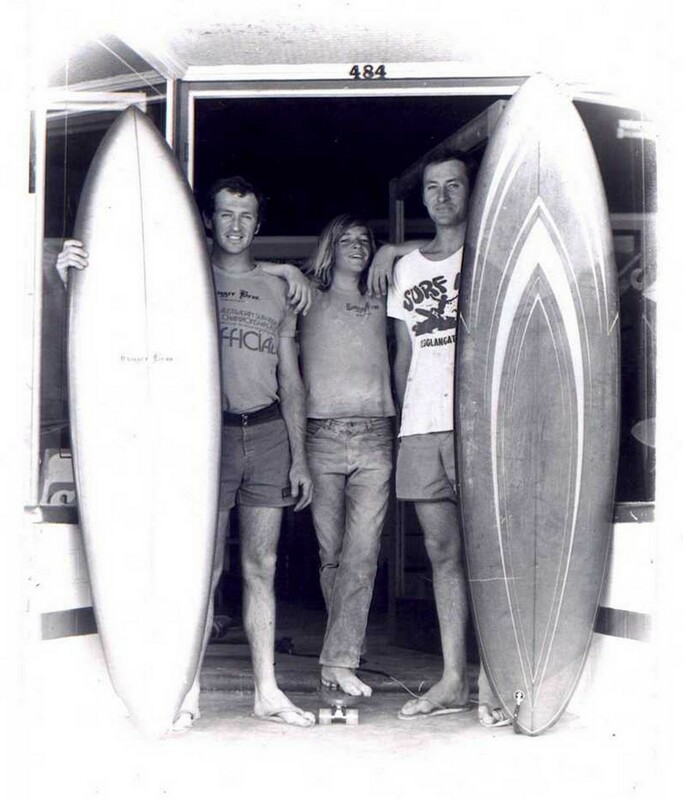 Ted’s energy and enthusiasm for a fast growing Surf Industry was a catalyst for us to expand. First with the establishment of the Peninsula Surf Centre then later a chain of stores. Ted’s passion for surfing and in particular chasing down big waves (Tidal Wave Ted ) was a key to our assault on the Competition Scene which had been dominated by the West coast. Thanks to all our Past and Present staff for contributing to what’s been an amazing 50 Year Ride with Trigger Bros Custom Built Surfboards.